There is something magical about snow days that never goes away. Thursday afternoon, as the flakes fell the faculty gathered in giddy anticipation of a possible day of freedom. Everyone prognosticated on the possible time the call would come. Would evening classes be closed? Would we miss out morning meetings? For me, it wasn’t as fun to think about – I don’t teach on Friday’s and tend to work from home – but still, there is something magical in a snow day. There are some universities that pride themselves on never closing. At MSU, classes met despite blizzards, white out conditions, -40 C / -40 F cold, and every other possible winter calamity. Only when the thermometer dipped below -70 F / -57 C did the doors close and were all students instructed to stay in our dorms. At Harvard, Nor’easters were generally no reason for no classes. When the sky dumped 20+ inches over night, only then did we get to stay home. SIUE is wiser. Our students generally commute to campus, often 30-60 minutes per direction. At 5:11am Friday I got email (the time stamp reported), telling me campus was closed. By 5:40 the faculty phone tree reached my voicemail, giving me a different digital form of the message. My husband (who also works from home), and I spent the day ignoring our snow filled driveway, inside and mostly warm watching the pretty weather. Today we played in the snow. 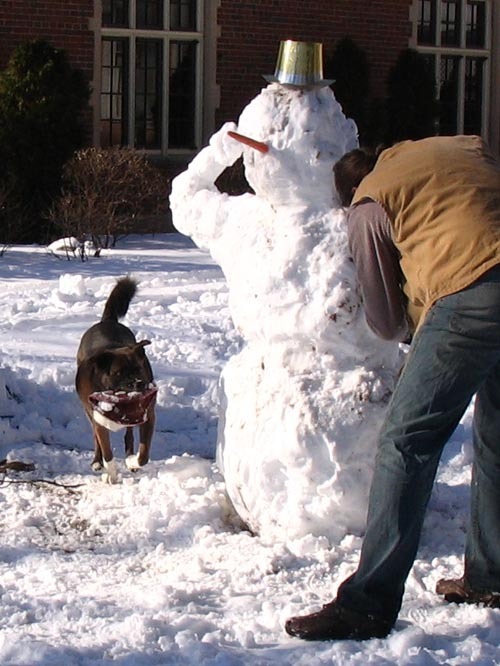 A snow man was built. The frisbee was thrown for the dog. Much fun was had by all. Some work was accomplished. The first round of Astronomy Cast buttons were sent out. Some email was successfully plowed through.Â¬â€ Mostly, we just enjoyed the white stuff. Woot for happy dogs in snow. We had a two-hour delay for freezing rain on Friday here in south-central Pennsylvania. The university opened at 10am, so I missed my 9am class but went in for my office hours 10am-noon. It was above freezing by then. But we also have a lot of commuting students, so it was a good call. That makes a difference in how universities handle bad weather. They just needed to let us know before 6:05am. It would have been nice to crawl back into bed for another hour. Even though missing a day throws off the schedule, it’s still fun to play in the snow. I’m still hoping we’ll get some to play in this season. Last year my kids built a snow fort. I remember one snowstorm when I was in grad school at the University of Maryland when the meteorology grad students were playing with the computer models and predicting 20+ inches of snow when the weather service was predicting under 12 inches. It was February 1983, and I think the university closed for a week. We had thundersnow in that one, and the snowfall was well over 20 inches. I think those were fairly early computer models for such storms. Three cheers for snow days. specific story as to why that was the case. Now that I, as well, am working from home I still have issue with weather. which was about 500m away. I’m still surprised that -40C = -40F, ever since that science quiz question that pounded me (“which deg F = deg C” was the question). Did you choose that temperature on purpose? Snow I like, -40 I don’t.